WILLFREIGHT EXPRESS CARGO SERVICES is a Freight Logistics Solution company providing its services to customers globally. Our head office is located at The Aerospace Logistics Centre (TALC), Wilson Airport, Nairobi, with branch offices at JKIA and Mombasa. Our operations cover every major city and port world wide. WILLFREIGHT AT THE CREST OF THE GLOBAL AEROSPACE LOGISTICS CHAIN. Willfreight Express Cargo Services was once again nominated by Kenya Airways as one of the best Cargo Agent in the Kenya, 2018. The impeccable event was held at the KQ Headquarters on 18th Oct 2018 in a corporate event that was graced by the elite personalities in the Aviation industry; representing various companies all of which key players at the helm of the Aerospace Logistics Industry. Willfreight Express Cargo Services was represented by the Exports Team and the Managing Director, all of whom utterly prepared to expressly epitomize the quality services the company offers to its customers. Willfreight Express Cargo Services and Kenya Airways personnel pose for a photo. There were different categories for the awards among them being; Live shipments cargo award, General cargo, express cargo, perishable cargo, pharmaceutical cargo name them. Willfreight Express Cargo Services was among the top three performers that managed to scoop prized awards in the General and Pharmaceutical categories for its exclusive performance. Willfreight Express Cargo Services derives its drive from the satisfaction of its highly esteemed stakeholders and would therefore like to appreciate KQ for the earnest recognition, warm reception and the opportunity to shine with the top notch cargo agents. Willfreight looks forward to an even more cordial relationship with Kenya Airways. Willfreight Express Cargo Services has the photos below to share with you. The creme de la creme Cargo Agents receiving their coveted prizes from Kenya Airways, KQ. Willfreight Express Cargo Services Managing Director poses for a photo together with one of Willfreight’s most esteemed partners from India – M.D. Zeus Air Services Pvt. Ltd.
Willfreight Express Cargo Services Managing Director together with the Exports team pose for a photo holding their prizes from KQ at the entrance of The Aerospace Logistics Centre building. Willfreight Express Cargo Services Export team pose for a photo holding their prizes from the KQ best Cargo agents award. EXCURSION THAT WAS, IS AND SHALL BE FOR TEAM WILLFREIGHT EXPRESS CARGO SERVICES MANAGERS. After several months of due diligence at work, Willfreight Express Cargo Services’ management team settled on an excursion to Ngong’ hills on September 28, 2018 with the sole objectives of breaking monotony, enjoying the breeze and refreshing air of the hills, stretching and most importantly bonding with one another. The team set off for the task at about one in the afternoon and managed to arrive at Ngong’ Hills shortly after two, excited and prepared to explore the hilly hinterland of Kajiado County. Before commencing the planned activities for the day, the team decided to take their packed meals in a bid to amass the requisite strength which was essential for the demanding task that laid before them. Going uphill was taxing due to the steep slopes of the hills. The afternoon winds that swept through the hills were also so strong and carried in it some dust particles. Part of the team could be heard chatting about the strength of the prowling wind as they felt it swaying them about. The most terrified bunch had to clasp their hands firmly together in order to defy the might of the powerful winds which appeared to whirl about the gigantic KENGEN wind turbines as though they were light chicken feathers. After enduring the climbing of the first of the seven hills, only close to a quarter of the number present still had the reserved strength enough to endure the steepness of the second hill. The robust fellows gave the second hill a shot as the others descended downhill to wait at where the company vans were parked. The ‘winning team’ as they dubbed themselves was very cheerful about being the only ones with the stamina to stomach the intensity of the uphill task. Since time had become a constraint and the activity required ample time to complete, it was very cold and security was also of essence since the hills were bordered by thick forests, the group had to forfeit further hiking and call it a day. The objectives of the short trip were however met as conversations on various encounters were exchanged heartily among the obviously worn out people who had to resort to reclining their seats in order to allocate more room for repose and soothe their aching muscles as the van cut through the night dropping each person at his preferred location. It was a moment treasured by all since the following week, everyone was rejuvenated, refreshed and proactive as they fulfilled their duties with the aim of giving even better services to the customers. WE ARE THE BEST AHEAD OF THE REST : CLEARING AND DELIVERING AN AIRCRAFT IS ONE OF OUR MAIN AREAS OF SPECIALTY. 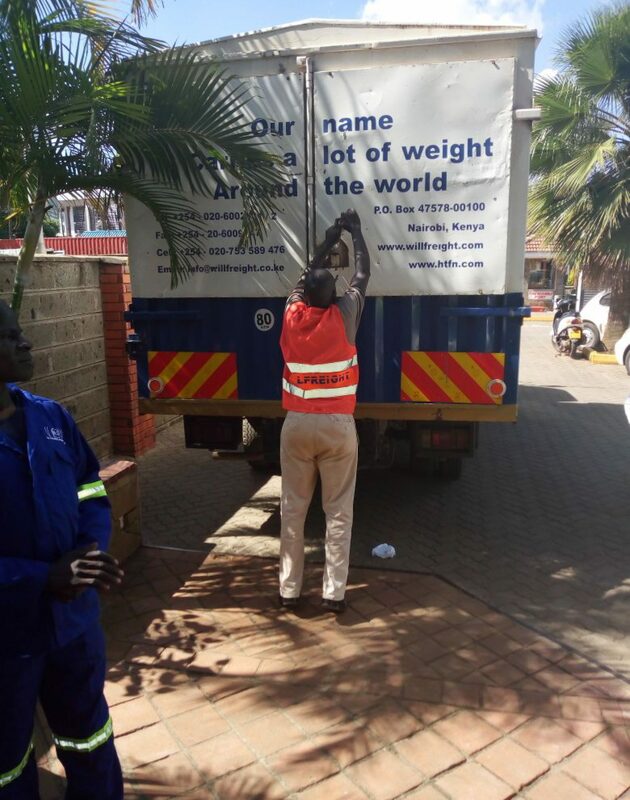 Willfreight Express Cargo Services once again was charged with the mandate to clear An aircraft at the customs offices and deliver it to the client’s premises at Ruiru. The process was swift owing to Willfreight Express’s outstanding reputation in the logistics industry and the good rapport prevailing between the company and the customs officers. The Aircraft was delivered on time to the expectation of the client who could not conceal his excitement at how the highly valuable shipment was handled with tremendous caution. This client in question is Willfreight Express Cargo Services’ long time business partner whose continued support has cemented the relationship that exists between the two global aerospace industry colossi. The title speaks for itself. It was a race of beasts with the mission of proving who was mightier enough to survive demanding challenges and ultimately emerge victorious. Machines against nature and man at the heart of the tussle. Monster trucks, all customized to confront the terrain were in action. It all happened in Masai – land. Among the participants, our highly valued client, who displayed a dazzling performance despite the hurdles they encountered in the heat of the contest. The truth is that passion supersedes obstacles and this exceptionally determined entity proved it by defying all odds. Willfreight Express Cargo Services fraternity engaged in sponsoring the client in question and very often extends its hand to them when called upon. This highly esteemed customer had the below piece as a testament of involvement in the extremely competitive event. We are safely back in Nairobi after Rhino Charge 2018 and I wanted to send you through a quick report on how we got on along with some photos and video clips. This year’s event was held in Masai-land approximately 250kms from Nairobi … and was another true test of ‘man & machine’. After the issues faced last year where only 1 car finished the course after having used many of the tracks, the organizers created a shorter but challenging route which presented tricky moments for both the larger, modified cars as well as the smaller ‘stock’ vehicles such as ours. We managed to make it successfully off the start-line at 0730hrs (actually making the start has been an issue for us previously) and after a difficult route through to our first checkpoint, we quickly got into our rhythm and made it up and down the steep hills and across the ridges through some pretty thick bush. By 2.30pm we had done 6 checkpoints and arrived at the infamous Gauntlet section … but by this time we had smashed our front windscreen, our front winch had blown and our diff-lockers weren’t working so we had reduced traction. We managed to successfully rock-crawl through the 3 checkpoints at the Gauntlet but whilst trying to exit the Gauntlet we sheared all 8 bolts on our axle-hub and we lost drive to the front wheels. With only 2WD and no diff-lockers we just weren’t able to climb the steep sides and continue the final 2 hours of the Charge. We did eventually manage to get the car out of the Gauntlet after the event had finished and once we got our diff-lockers working again. So we ended up 24th out of 57 starters and our distance of 22.74 kms for a total 9 checkpoints was very competitive. It was obviously a shame that we lost 4wd because if we had been able to complete just another 2 checkpoints then we would have been Top 10!! One of Willfreight Express Cargo Services’ policies is based on environmental conversation. The company deeply acknowledges the participation of its particular client in an event that is in line with the company’s deliberate measures in maintaining an Eco-friendly environment. Willfreight Express Cargo services (WECS) handles customs clearance and delivery of the most precious trophy-FIFA world cup trophy in Kenya. This is the second time WECS has been entrusted by the multinational Coca-Cola Company to carry out the logistics involved. The need for new ideas and improvement in supply chain in the aerospace logistics industry has risen due to the increased desire to travel and the demand for air travel. As a result, the demand for new planes has become immense. The establishment of new routes, presumably more than 700, has improved connectivity all over the world. Also, a fall in average return fares has increased accessibility (a fall by $44 in 2016 – according to sources in the International Air Transport Association – IATA). Research by Airbus through “Global Services Forecast” reveal a Maintenance Repair & Overhaul (MRO) business totaling $1.8 trillion and the need for in excess of a 500,000 new pilots over the next 20 years. To counter the pressure springing from the demand in the aerospace industry, the need to produce more planes using an efficient and profitable method has arisen. This ranges from producing lighter aircraft with lower fuel consumption to using materials source geographically diverse supplier base. For this reason, the aerospace companies are force to hire third-party logistics (3PL) providers to manage inbound materials movement, production, maintenance, repair, and overhaul operations. In summary, supply chain logistics. Sustainability is therefore a matter to pursue in the aerospace industry as it is key to commercial aerospace growth and logistics. Proximity service/supply – involves situating service/supply centers close to where customers are located. In Kenya, the arrangement is a common sight in Wilson airport. It is one of the best examples when it comes to the Kenyan aerospace industry. Willfreight Express Cargo Services Company, specialized in brokerage, clearing and forwarding is therefore strategically placed in Wilson Airport to fulfill the demands and the needs of its surrounding (close or far away) customers in a fast, convenient and efficient way. Establishment of regional and well-connected centers located strategically around the world. There, pools of unit spare parts and exchange units can be stored and then sent to the customers when needed; so long as they can arrive in time and meet customer service obligations. As manufacturing supply chains become more disciplined, inbound materials movement is becoming less urgent and more synchronized, with supply chain managers monitoring flow and communicating with suppliers to address exceptions. Supply chain is therefore very substantial to the daily activities involved in the industry and most importantly with the consideration of the rapidly growing aerospace industry. WHAT HAPPENS WHEN YOU HAVE A TIME SENSITIVE PROJECT THAT IS HELD BY DELAYED CARGO? The project that you have been pitching for is finally approved. You breathe a sigh of relief. What now? Everything has been captured including the shipment of equipment to project site and the duration of time it will take, and you have all the confidence that you did your homework well, even adding a day or two just in case..
Then you contact the supplier and pay for the equipment and give directions to the site location, probably somewhere remote. Your agent even gives you the tracking details and assures you that in a few days, your cargo will be on site. Two weeks later, the cargo is stuck at some border country just because some paperwork wasn’t done correctly and now you are exasperated. Or your shipment weight 20 tons and it has to go to Praslin Island in Seychelles. The maximum weight handled there is 8 tons! This story might sound far-fetched, but it is a regular issue in cargo movement and logistics. Several things will determine the timeliness of your cargo arrival, such as the agent you have appointed, your agent partners, the cargo carriers, agent liquidity, etc. But the crux of the matter is that the complexities of sending and receiving cargo are such that no person should be unable to send or receive cargo anywhere in the world. Should be trust worthy, honest and professional. Industry savvy, to tackle challenges as they arise. Understand local nuances to advise you accordingly on issues such as taxes, fees and levies. Financial standing so that your shipment and its proper delivery may be top issue, rather than the fees that you will be charged.